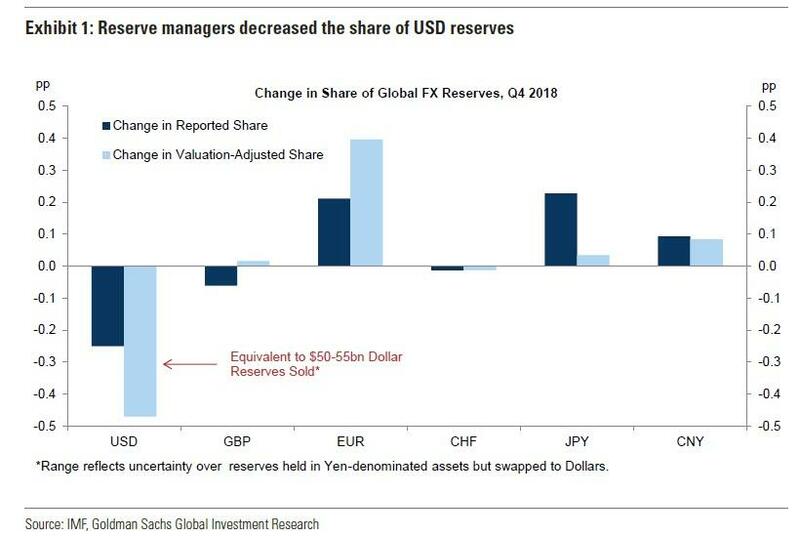 The chart below shows the main takeaways from the report: reserve managers actively decreased their allocation to USD—the share of USD reserves declined despite modest Dollar appreciation—while they actively added to EUR and CNY reserves. According to Goldman calculations, the drop in Q4 USD reserves was equivalent to just over $50 billion in dollar reserves sold. More specifically, the reported USD share of allocated reserves declined by another 0.3% in Q4. Cumulatively, the USD share has fallen by 3.7% since the end of 2016 and by 1.0% in 2018 (despite supportive Dollar price action). Against this, reserve managers continued to add to their EUR reserves with the reported EUR share increasing by 0.2% this quarter, and by 1.6% on net since the end of 2016. Both in Q4 and 2018 as a whole, reserve managers more than offset a weaker Euro to keep the share of EUR reserves on a rising trend, despite a number of political and growth tensions and concerns. Meanwhile, as shown in the next chart, reserve managers continued to increase their allocation to JPY, although this was mostly due to yen appreciation in Q4. Still, at 5.2%, the share of JPY reserves is the highest it has been since June 2002. 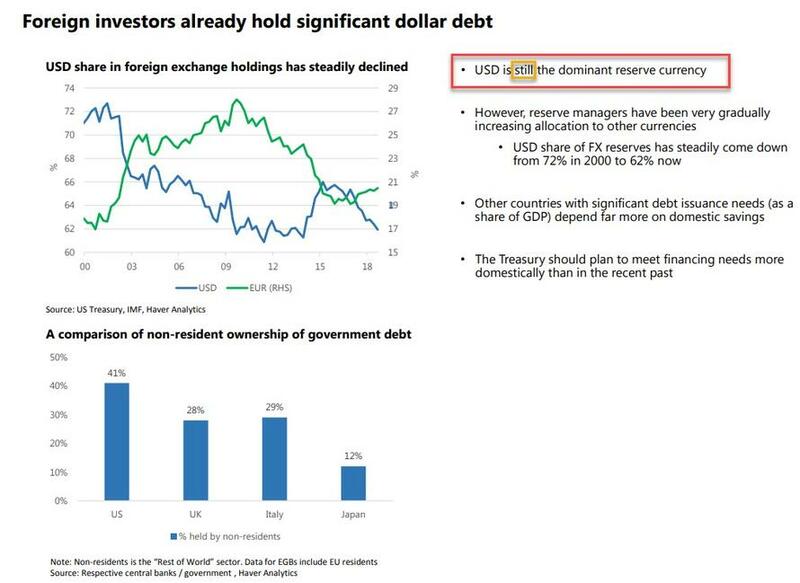 According to Goldman, this can be at least partially attributed to reserve managers purchasing Japanese securities on an FX-hedged basis in order to take advantage of the wide Yen cross-currency basis. However, it is worth noting that the USD share appears to be on a declining trend even after accounting for possible JGB asset swap trades. 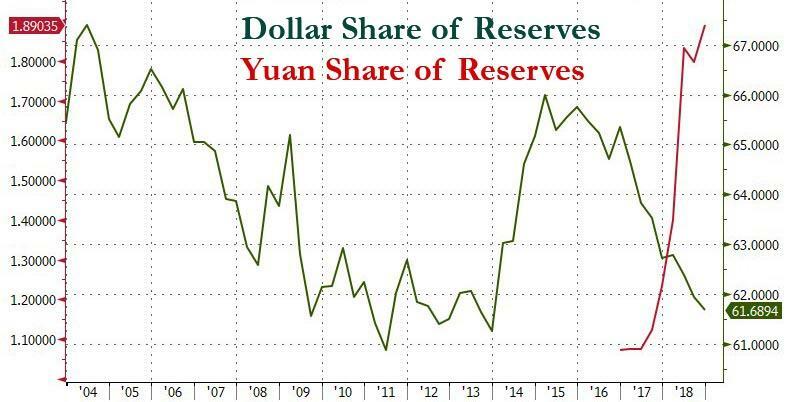 Finally, the share of Chinese Yuan reserves continued to increase in Q4, which according to Goldman was almost entirely due to new inflows, and as the bank concludes "de-dollarization flows from Russia account for the substantial increase earlier this year." Commenting recently on the ongoing currency reserve trends, Standard Chartered's head FX strategist Steven Englander said that political rifts between the U.S. and other countries could be to blame, but the numbers don’t offer firm conclusions. Back in September, when the dedollarization trend first emerged, Alan Ruskin, global co-head of foreign-exchange research at Deutsche Bank said that the shift to allocated reserves could also be skewing the data: "I wouldn’t go too far in running with the idea that people are shifting out dollars in any aggressive sense." Still, the ramifications of the shift away from dollars are significant. 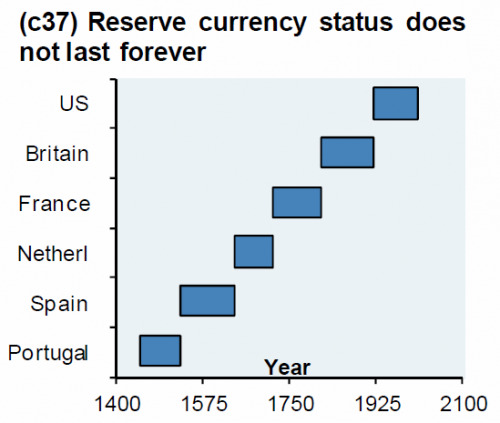 For more than a half century, the dollar has been the reserve currency of choice for most of the world’s central banks, for its depth and stability in global markets. That may be changing: as we reported at the end of January, both the Fed and the Treasury Borrowing Advisory Committee (or TBAC) are increasingly worried about the future status of the reserve currency as confirmed by the tongue-in-cheek observation that reserve managers have been very gradually increasing allocation to other currencies, and that although the USD share of FX reserves has steadily come down from 72% in 2000 to 62% now, the "USD is still the dominant reserve currency." The question is for how much longer.